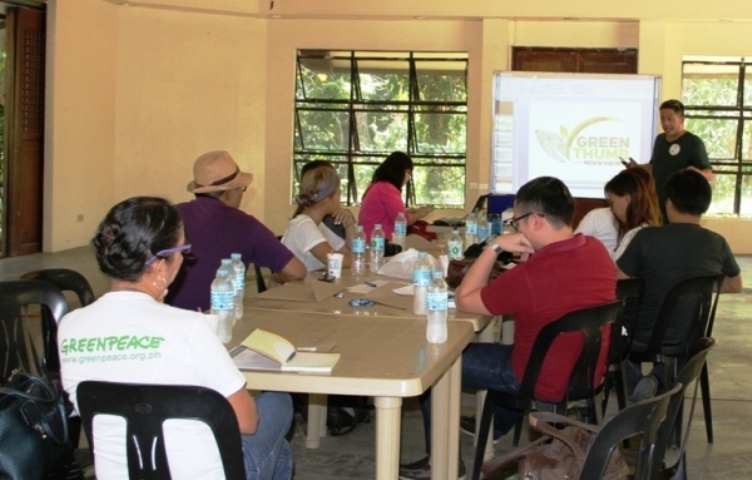 With an aim to protect the environment, the first batch of bloggers recently held a green agenda with Green Thumb Coalition at La Mesa Ecopark . JP David discusses the role of the Green Thumb Coalition with “green” bloggers. As local and national elections is fast approaching, the Green Thumb Coalition spearheads the first meeting of various bloggers who are willing to address the environmental issues in the Philippines. Large scale mining, coal plants, oil palm expansion, land-grabbing among indigenous people, conversion of forest zones, these are just some of the environmental devastations happening from different parts of the country. Bloggers say, that they can contribute to the environmental advocacies through their blogs. And that they will not just remain as travel neither food bloggers, but to be more responsible bloggers for the environment. “Napakahalaga ng role nating mga bloggers, we can help push the presidential candidates to consider this Green Thumb Coalition as an eye-opener, we bloggers can do something for our environment.” Leonora Lava, Senior Ecological Agriculture Campaigner of Greenpeace Southeast Asia, articulated with her fellow bloggers. The Coalition encourages the bloggers to be the catalysts on educating the people and even millennial voters on the importance of choosing the right candidates who are concerned for the environment and for future generations. "This is for our future! Environment is a very fragile thing. Once it’s gone, it’s gone! And I believe that this is our responsibility as citizen journalists, as bloggers, to protect the environment.....As bloggers, we have a powerful tool and we can do something for our environment.” said Ivan Henares, Renowned Blogger and Assistant Professor of UP Asian Institute of Tourism. On the other hand, ABS-CBN Lingkod Kapamilya Foundation’s Partnership and Advocacy Director Norie Garcia reiterated that bloggers can help fight for the environment through their powerful tool, their blogs. Biodiversity, Natural Resources and land use management, human rights and integrity creation, climate justice, sustainable development , waste management, and sustainable agriculture are things that the Coalition wants to address. The Green Thumb Coalition is scheduled to convene the second batch of bloggers’ meet up soon.